It had literally been a month since I’d shot my last sunrise so I was itching to get out again. I joined a few friends including Deb, Gerry and Ron for this sunrise session at Whale Beach on Sydney’s far Northern Beaches (last year! :)). It was yet again another near cloudless morning so we weren’t expecting any sky fireworks :). We’d arrived here fairly late – I normally like to be on location around an hour before sunrise but today that wasn’t going to happen. After the others arrived we headed towards the southern end of Whale Beach to the tidal pool there. We did a bit of a recce of the pool and onto the rocks past the pool and checked out where the sun would rise on TPE. In the end I decided I liked the few rocks at the southern end of the beach just before the pool best so I headed back there. 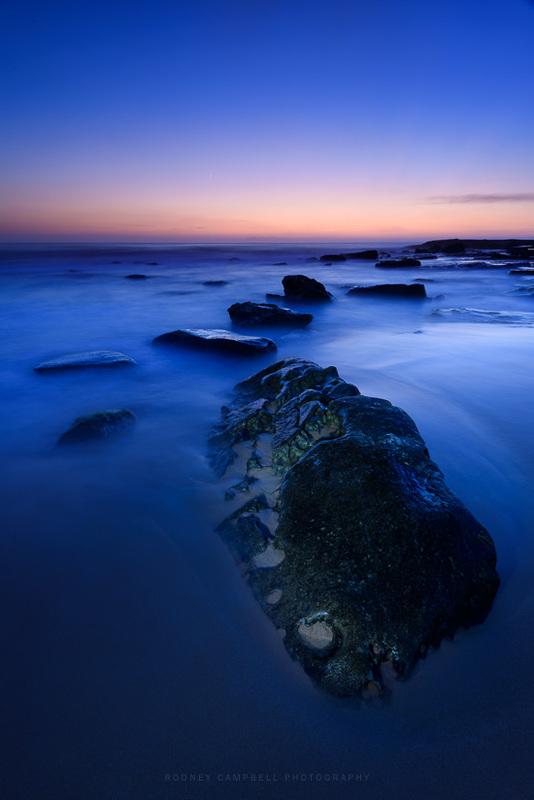 The image above was my first composition – in fact first shot of the morning. Right on 6AM it is only twenty minutes till sunrise. This shot is a manual layer blend of three exposures on layers in Photoshop. The majority of the image is from a single shot however I’ve blended in a little from another exposure for some of the water swirl and from a third just for the light painted rock in the foreground. 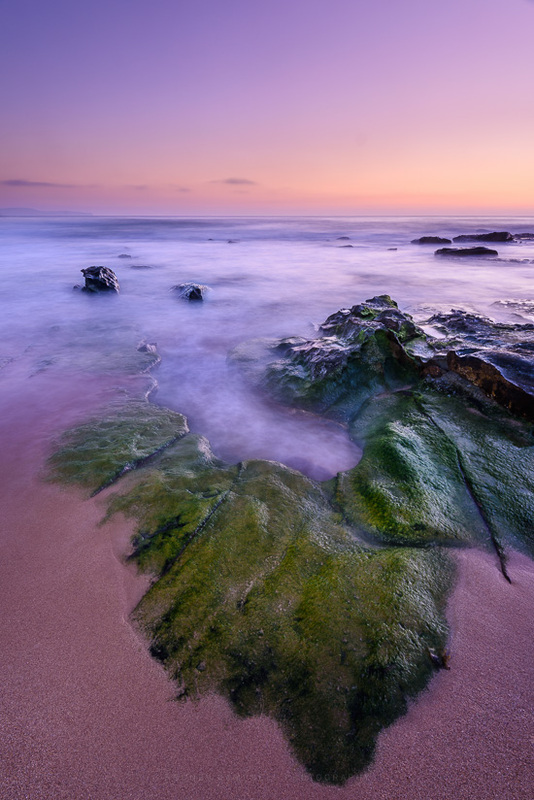 Below we have a single exposure taken almost ten minutes later composing with this very interesting shaped mossy rock in the foreground in the sand. I’ve again light painted the foreground a little to bring it out of the darkness – it’s still more than ten minutes till sunrise. Just before 6:30AM and the sun had already risen just to the right. I’ve setup on this small channel of rock to take my last shots of the morning. This is a manual blend of a couple of exposures as layers in photoshop. The base image for almost the whole frame and then I blended in some nice water movement in the channel at the bottom from another frame with better water structure there. 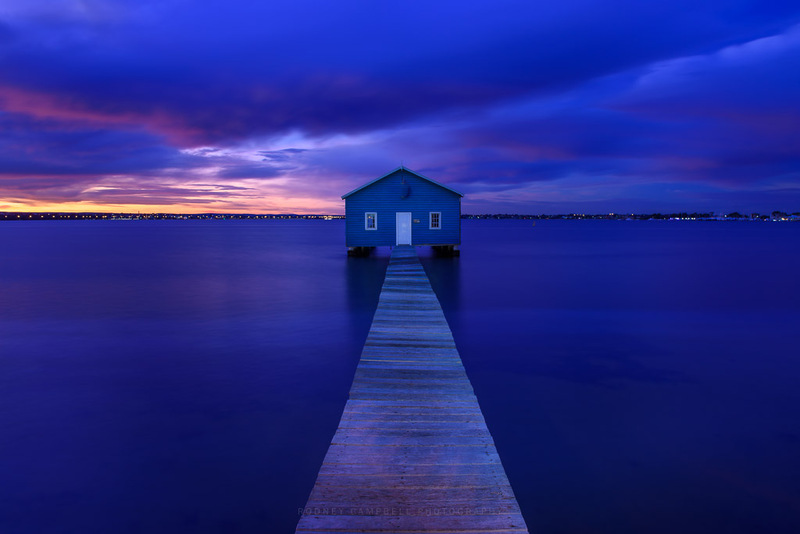 The Crawley Edge Boatshed (or that little blue boathouse) is a well recognised and frequently photographed site at Crawley in Perth, Western Australia. It is thought to have been originally constructed in the early 1930s. 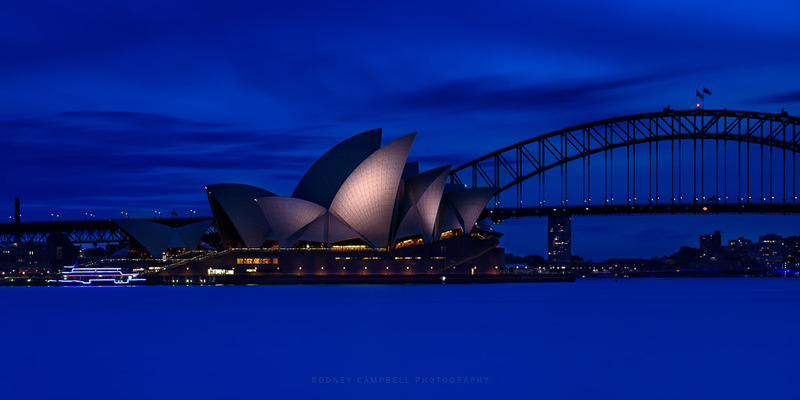 It’s literally been photographed to death but as I was in Perth I felt I had to go and take some photographs of this iconic location for myself before leaving. 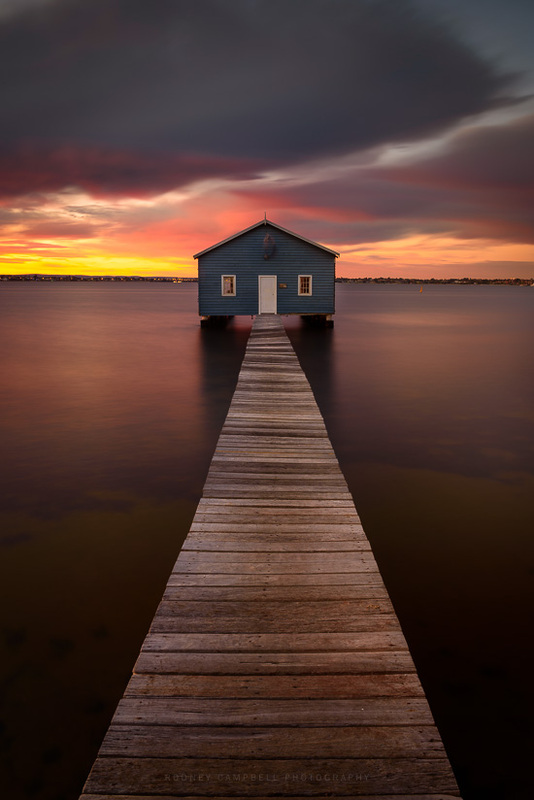 The boatshed itself sits at the end of a narrow wooden boardwalk leading out into the Swan River just off the foreshore below Kings Park near The University of Western Australia. The shed has been painted a very nice shade of blue which does contrast nicely with those warmer sunrise or sunset colours. 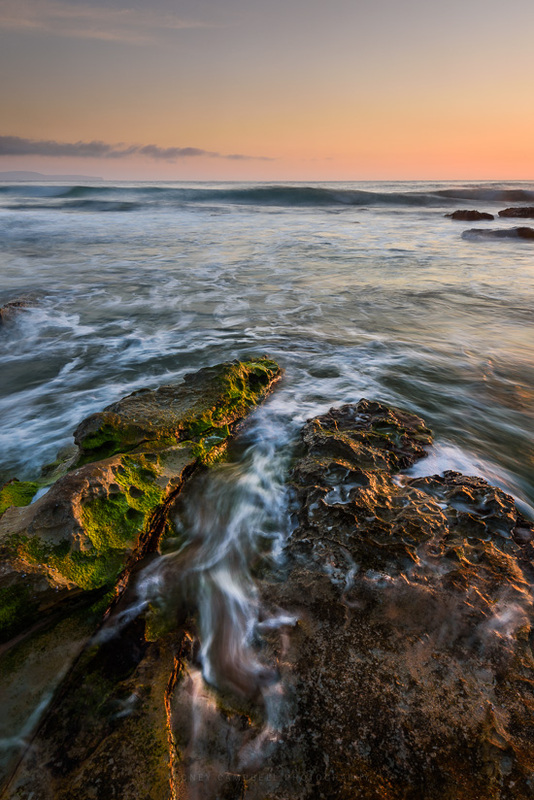 This location is actually positioned very nicely for both sunrise or sunset shoots. I decided to head there for sunrise and I was there and setup at the end of the boardwalk very very early, well before sunrise. It’s actually quite fortunate I was the first to arrive. The boardwalk is very narrow (barely wide enough for one person) so I got the prime position right at the start of the boards – those who arrived well after me had to shoot over me from the steps right behind me. 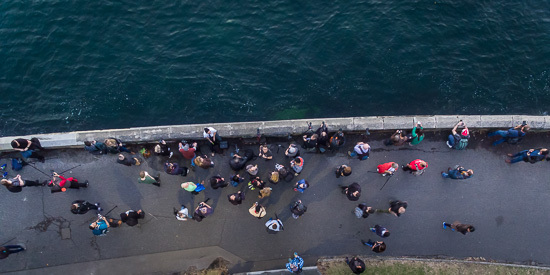 Spent a very nice afternoon and evening at the Sydney Trey Ratcliff Photowalk. 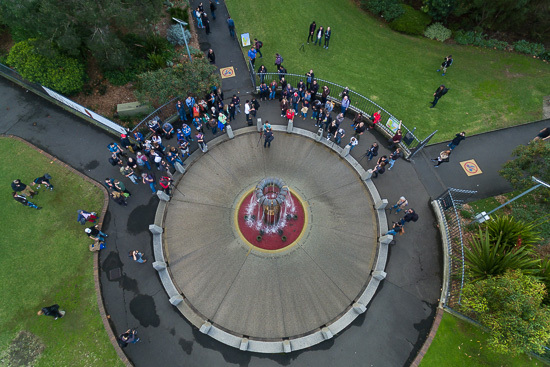 We started at the Archibald Fountain in Hyde Park and finished for sunset at Mrs Macquarie’s Chair down on the harbour. 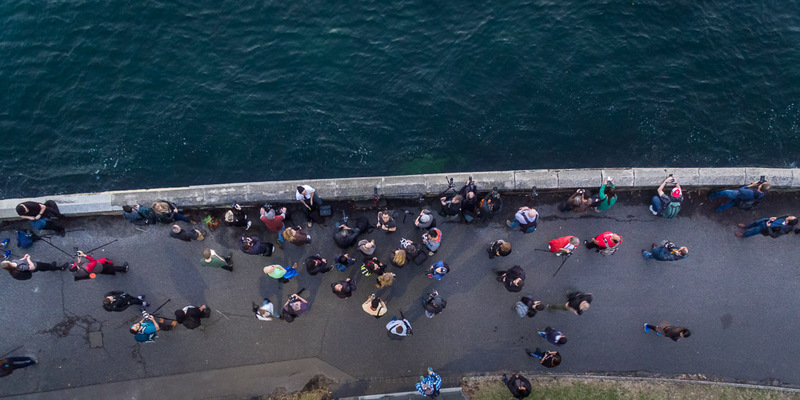 Mrs Macquarie’s Point is often a spectacular location for sunset on the harbour. With the sun setting behind Sydney’s iconic Opera House and Harbour Bridge, along with uninterrupted views of the Sydney CBD skyline across the waters of Farm Cove it’s an ideal spot for photography. Unfortunately the weather Gods didn’t give us good colour and colour for sunset but the light was soft and beautiful with a nice blue twilight to follow. 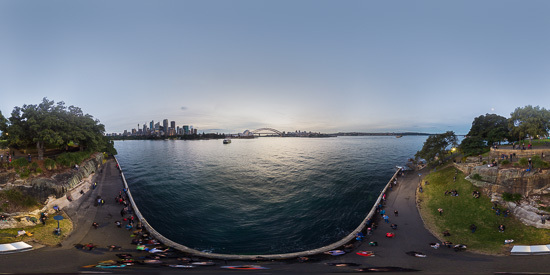 I’m still just starting to experiment with these 360˚ photospheres taken with the DJI Phantom 4 drone and the DronePan software. 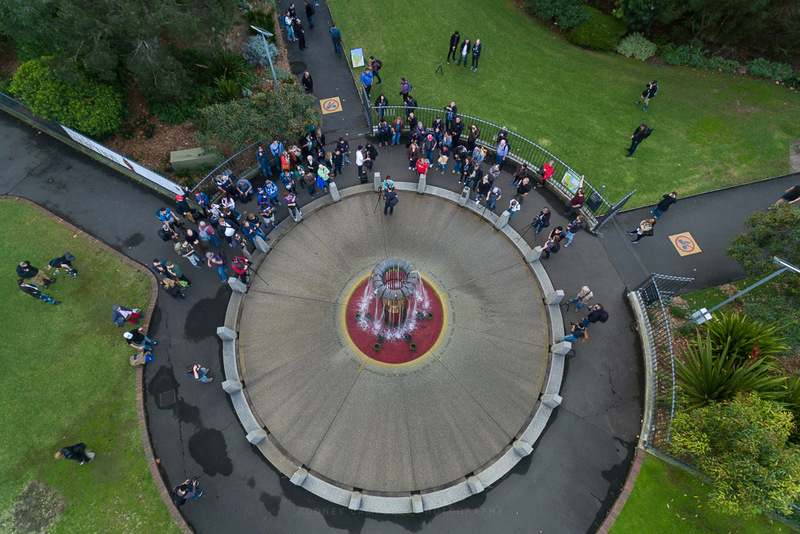 This is my third full 360˚ panorama with the drone. This little interactive window gives you a birds eye view of us taking photos at this spectacular location soon after sunset. Using your mouse or keyboard (arrow keys) you can control your view and pan around the scene (and even zoom in and out). Clicking the square box icon towards the top left corner also allows you to run it full screen. Great to catch up with so many old friends, some I havn’t seen for ages, and to meet and make so many new on our Sydney Photowalk with Trey Ratcliff. Thankyou all for making it a great afternoon out – looks like we got a lucky break in the weather. I only took a grand total of two frames with my “real” camera – but I think that’s what photowalks are really about – spending good times with others with shared interest and just chatting :). 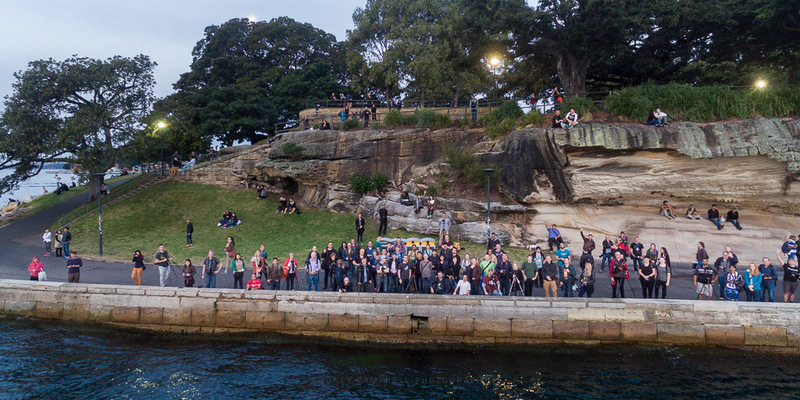 The group when we’d finally made our way down to Mrs Macquarie’s chair for sunset. The sun has now set it was time to put away the drone and bring out the “real” camera. There wasn’t any real colour in the sunset sky but there were some nice whispy clouds in the sky so I figured a classic long exposure with our cliche icons might be the go. This is the first of those two frames with the D-SLR. 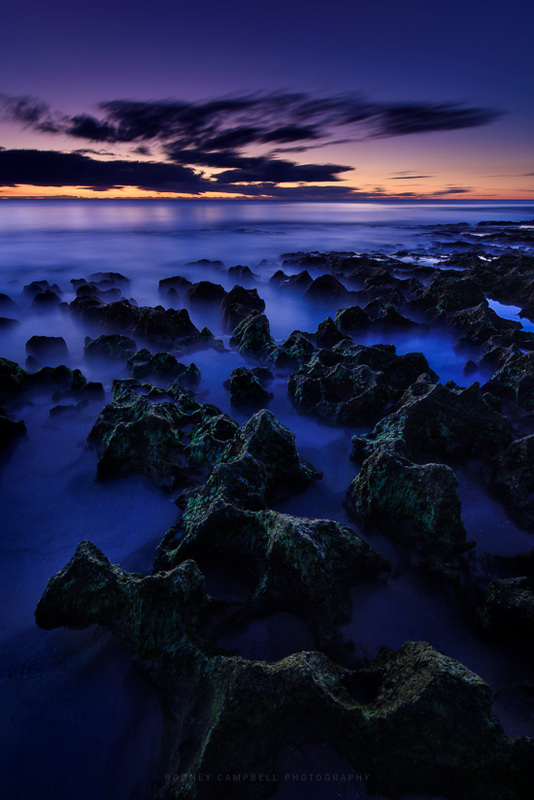 A two stop graduated neutral density filter (Lee 0.6 hard) over the sky (horizon upwards) and a six stop ND filter (Lee LittleStopper) over the whole scene to lengthen the exposure. Thanks too to Stephen Godfrey, Francis Gorrez and Paul Carmona for unknowingly choosing the shutter time for this one:). Tho they didn’t know it at the time as I had simply asked them to “pick a number?”. The consensus was Pi… so 3.14 (minutes it was)! Serendipity must have been on our side – the exposure was just about perfect… freakish luck perhaps :). I was originally planning to do 2 minutes so when they came up with Pi I wasn’t massively concerned 🙂 – now if they’d said something like 42 then I might have been in some trouble :). I was taken out for a sunset shoot at the aptly named North Beach by one of the Perth locals that I’d met through Google Plus. Melissa was extremely generous to pick me up where we were staying and taxi me all the way up to North Beach for sunset. We only just barely made it in time arriving just on sunset :). The clouds weren’t giving anything away this evening, but as with many of these Western Australian sunsets the red in the sky as the sun dips over the horizon is tantalising. The sun had already set by the time we got on the beach so I had to work very quickly before the light faded too much. I started with a few test compositions and exposures and then settled into some long exposures. This image with the Lee 3 stop grad along with a two stop ND and the polariser got me out to over 300 seconds at ISO 50 & f/16. It’s actually a manual exposure blend of two long exposure frames – one basically for the sky and one for the very dark foreground rocks area. The foggy mist created by the long exposure almost makes these sharp but incredibly interesting rock formations I’d walked out over look like mountains rising out of the mist and clouds. The green mossy covered rocks on the foreshore were really unusual, I’d have loved to have had more time to explore the compositional possibilities in this area. Some really spectacular foreground interest on offer. 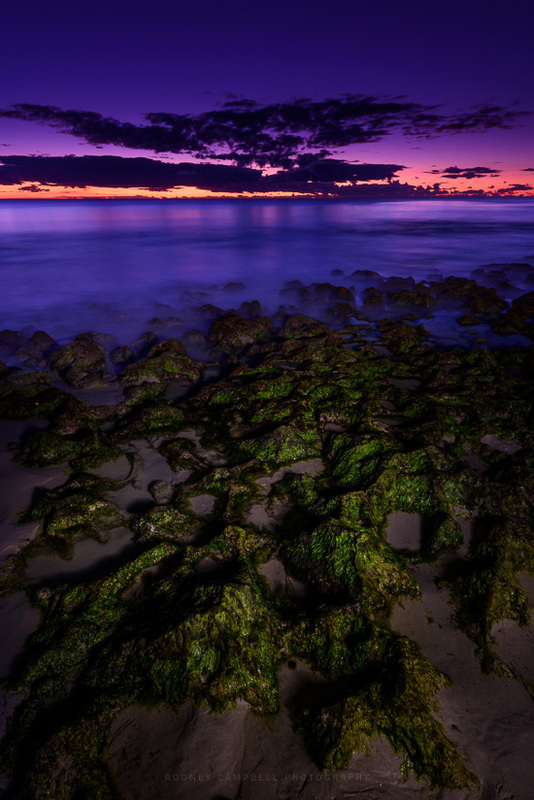 It was getting dark fast (especially when taking really long exposures) so I ditched the ND’s and whacked on the reverse grad to pick up some nice twilight colour in the sky along with some light painting of those interesting spiky jagged rocks in the foreground. This one at 6:25PM and 30 minutes after sunset. I’d only taken fourteen (14) shots this whole day so I was pretty happy that I got two pretty decent images out of this shoot – a more than acceptable hit rate. Then it was off to a well earned dinner out of the freezing cold, how Melissa survived walking around in bare feet on the beach at this temperature I’ll never know :).